Illegal or Abusive Usage is Strictly Prohibited. Other than content you own, which you may have opted to include on the Website, under these Terms, North Metro Storage and/or its licensors own all rights to the intellectual property and material contained in the Website, and all such rights are reserved. All content included on the Website, such as text, graphics, logos, button icons, images, audio clips, digital downloads, data compilations, and software, is the property of North Metro Storage, protected by U.S. and international copyright laws. The compilation of all content on the Website is the exclusive property of North Metro Storage and protected by U.S. and international copyright laws. All software used on this site is the property of North Metro Storage or its software suppliers and protected by U.S. and international copyright laws. The Website graphics, logos, page headers, button icons, scripts, and service names are trademarks, registered trademarks or trade dress of North Metro Storage in the U.S. and/or other countries. The Website and/or North Metro Storage’s trademarks and trade dress may not be used in connection with any product or service that is not the Website and/or North Metro Storage, in any manner that is likely to cause confusion among customers or in any manner that disparages or discredits us. All other trademarks not owned by North Metro Storage that appear on the Website are the property of their respective owners, who may or may not be affiliated with, connected to, or sponsored by us. If you use the Website, you are responsible for maintaining the confidentiality of your account and password and for restricting access to your computer, and you agree to accept responsibility for all activities that occur under your account or password. North Metro Storage reserves the right to refuse service, terminate accounts, remove or edit content, or cancel orders in their sole discretion. The Website is provided “as is,” with all faults, and North Metro Storage makes no express or implied representations or warranties, of any kind related to the Website or the materials contained on the Website. Additionally, nothing contained on the Website shall be construed as providing consult or advice to you. THE WEBSITE AND ALL INFORMATION, CONTENT, MATERIALS, PRODUCTS (INCLUDING SOFTWARE) AND SERVICES INCLUDED ON OR OTHERWISE MADE AVAILABLE TO YOU THROUGH THE WEBSITE ARE PROVIDED BY North Metro Storage ON AN “AS IS” AND “AS AVAILABLE” BASIS, UNLESS OTHERWISE SPECIFIED IN WRITING. North Metro Storage MAKES NO REPRESENTATIONS OR WARRANTIES OF ANY KIND, EXPRESS OR IMPLIED, AS TO THE OPERATION OF THE WEBSITE OR THE INFORMATION, CONTENT, MATERIALS, PRODUCTS (INCLUDING SOFTWARE) OR SERVICES INCLUDED ON OR OTHERWISE MADE AVAILABLE TO YOU THROUGH THE WEBSITE, UNLESS OTHERWISE SPECIFIED IN WRITING. YOU EXPRESSLY AGREE THAT YOUR USE OF THIS SITE IS AT YOUR SOLE RISK. TO THE FULL EXTENT PERMISSIBLE BY APPLICABLE LAW, North Metro Storage DISCLAIMS ALL WARRANTIES, EXPRESS OR IMPLIED, INCLUDING, BUT NOT LIMITED TO, IMPLIED WARRANTIES OF MERCHANTABILITY AND FITNESS FOR A PARTICULAR PURPOSE. North Metro Storage DOES NOT WARRANT THAT THE WEBSITE; INFORMATION, CONTENT, MATERIALS, PRODUCTS (INCLUDING SOFTWARE) OR SERVICES INCLUDED ON OR OTHERWISE MADE AVAILABLE TO YOU THROUGH THIS SITE; THESE SERVERS; OR E-MAIL SENT FROM US ARE FREE OF VIRUSES OR OTHER HARMFUL COMPONENTS. North Metro Storage WILL NOT BE LIABLE FOR ANY DAMAGES OF ANY KIND ARISING FROM THE USE OF THE WEBSITE OR FROM ANY INFORMATION, CONTENT, MATERIALS, PRODUCTS (INCLUDING SOFTWARE) OR SERVICES INCLUDED ON OR OTHERWISE MADE AVAILABLE TO YOU THROUGH THE WEBSITE, INCLUDING, BUT NOT LIMITED TO DIRECT, INDIRECT, INCIDENTAL, PUNITIVE, AND CONSEQUENTIAL DAMAGES, UNLESS OTHERWISE SPECIFIED IN WRITING. By visiting our website, you agree that the laws of the State of Minnesota, without regard to principles of conflict of laws, will govern these Terms & Conditions, and any dispute of any sort that might arise between you and us shall be exclusively decided in Anoka County, Minnesota. Certain areas of the Website are restricted from access by you and North Metro Storage may further restrict access by you to any areas of the Website, at any time, in its sole and absolute discretion. Any user ID and password you may have for the Website are confidential and you must maintain the confidentiality of such information. In these Website Terms & Conditions, “Your Content” shall mean any audio, video, text, images or other material you choose to display on this Website. This is unlikely to occur, but in the event Your Content is displayed on the Website, by displaying it, you grant North Metro Storage a non-exclusive, worldwide, irrevocable, royalty-free, sublicensable license to use, reproduce, adapt, publish, translate and distribute it in any and all media. Your Content must be your own and must not be infringing on any third party’s rights. North Metro Storage reserves the right to remove any of Your Content from the Website at any time, and for any reason, without notice. You hereby indemnify to the fullest extent North Metro Storage from and against any and all liabilities, costs, demands, causes of action, damages and expenses (including reasonable attorney’s fees) arising out of or in any way related to your breach of any of the provisions of these Terms. North Metro Storage is permitted to revise these Terms at any time as it sees fit, and by using the Website you are expected to review such Terms on a regular basis to ensure you understand all terms and conditions governing use of the Website. 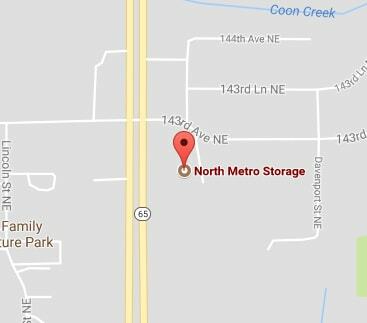 North Metro Storage shall be permitted to assign, transfer, and subcontract its rights and/or obligations under these Terms without any notification or consent required. However, you shall not be permitted to assign, transfer, or subcontract any of your rights and/or obligations under these Terms.